It is a type of agglutinogen called Rh antigen or D antigen present on the RBCs of 85% of the individuals. Those who have this antigen on the red cells are called Rh+. The name is derived from the experiment performed with the rhesus monkey’s cells mixed with the rabbit’s serum. The rabbit’s serum developed antibodies against the rhesus monkey’s red cells. This immunized rabbit serum, when tested with the human RBCs, agglutination was noticed in 85% of the samples tested. This showed that the human RBC contained an antigen, similar to rhesus monkey red cell antigen. Those who show this, on their red cells, are called Rh+.The remaining 15% of the individuals show no such Rh antigen on the red cell and they are called Rh–. Their plasma does not contain Rh antibodies, but produced, when Rh+ blood is given and sensitised. In blood transfusion, Rh+ blood should not be given to a Rh– person. In the first transfusion, the Rh– plasma becomes sensitised by the Rh+ red cells. 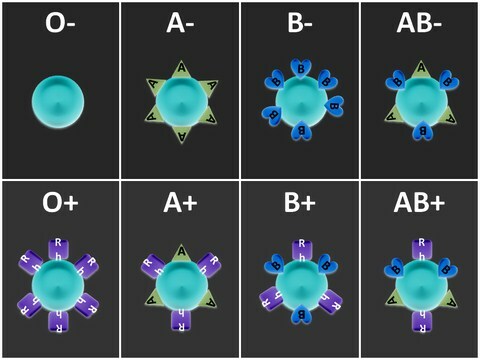 Subsequent transfusion of Rh+ blood to the same person, will result in agglutination reaction, due to Rh antibodies produced by the Rh– plasma against Rh+ red cells. Rh incompatibility also results, when an Rh– woman conceives Rh+ fetus, due to the Rh antigen being inherited from the father. In the first pregnancy, the fetal red cells, which are Rh+, enter the maternal circulation during child birth, when the placental blood vessels rupture. This causes sensitization of Rh– plasma of the mother. In the second or third pregnancy, the Rh– plasma, which is already sensitised with Rh+ fetal red cells, produces enormous Rh antibodies. It crosses the placental barrier and enters the fetal circulation. The agglutination of fetal red cells by the Rh antibodies, results in hemolytic disease of the newborn(HDN). The newborn will show severe jaundice and anemia. The peripheral blood shows the nucleated precursor red cells and hence the name erythro blastosis fetalis. Sometimes, the child dies in utero, giving still born births. If the jaundice is severe, it will lead to deposition of bile pigments in the basal ganglia, resulting in kernicterus. This Rh incompatibility can be treated by exchange transfusion of Rh– blood to Transfusion of blood Transfusion of whole blood is required in severe hemorrhage, surgery, and anemia (when Hb% Blood 177 falls to 40). There are conditions, where only the components of blood need to be given, such as, albumin, clotting factors, platelets concentrate, red cells, whole plasma, gamma globulins, etc. The blood selected for transfusion should be free from diseases like, malaria, syphilis, hepatitis and acquired immune deficiency syndrome. If an individual comes to know earlier of the requirement of blood for transfusion, as in undergoing surgery, the safest way, is, to collect his or her own blood periodically at regular intervals and use it during surgery. This method of transfusion is called autologous transfusion. Transfusion should not be rapid (The rate should be 100 to 200 ml/hour).